Get ready to read in bed! 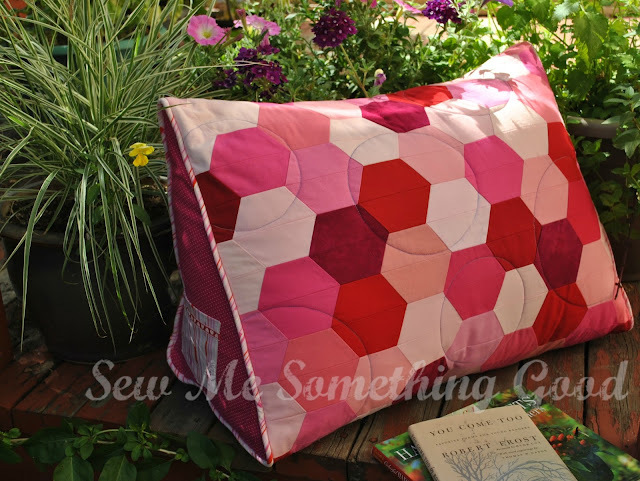 Pattern writing, drafting and editing behind me (for this pattern at least) I can now look forward to hearing what you think while hoping you'll love making your own Triple Hex Reading Pillow. That will be the best reward of all. Yesterday, I introduced my new pillow design to you and had planned on having the pattern available then, but I hope you will forgive me for the one day delay. I've designed the pillow so that you can use pre-cuts for the piecing, and let me tell you, hexagons were never so easy! Half a hexagon is something that can be sewn into strips. 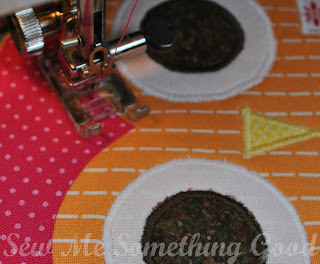 No hand- piecing involved so the sewing goes fast! and then you can purchase my pattern. Hexie Hop Day #3 - My day! 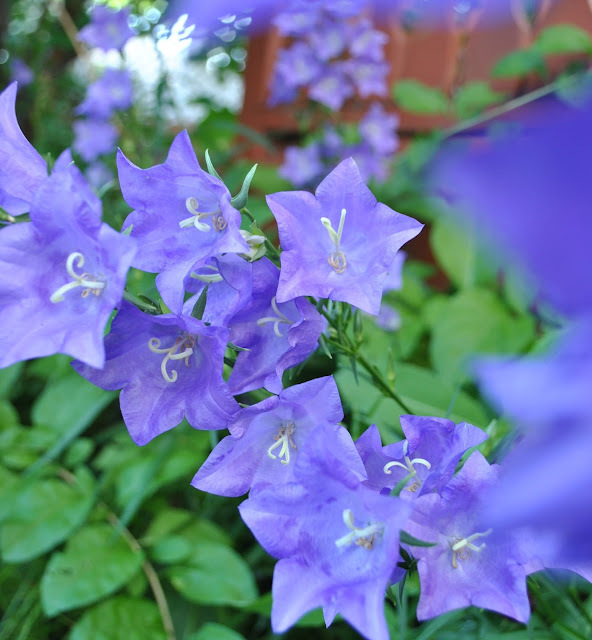 I hope you've been enjoying visiting all the blogs on this hop. 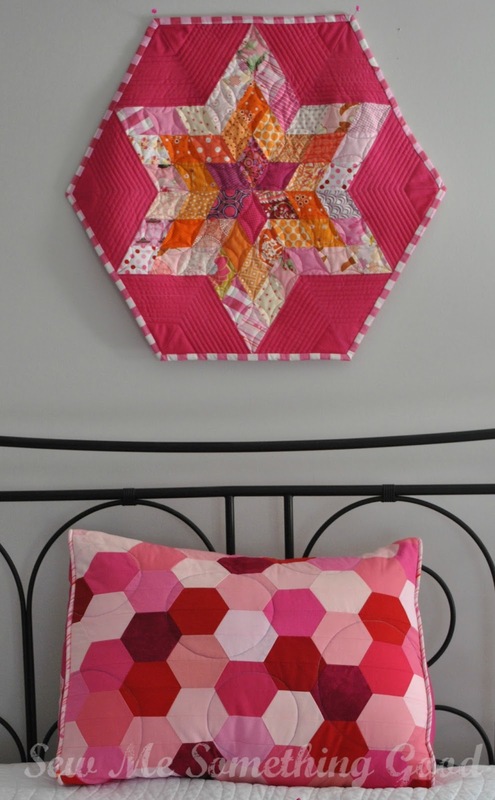 There's been so many wonderful hexie projects to admire and be inspired by (and there's more to come... aren't we lucky! ;o). First off, I want to give thanks to the two ladies that made this hop happen. A lot of work goes on behind the scenes of these hops, without which, we would not be having so much fun. Three cheers to cheerleader and Hexie Queen, Debby, for being our wonderful hostess on this hop. Special thanks and appreciate cheers also go to our headcheerleader and Queen of Fun, Madame Samm, for her boundless creativity and enthusiasm. What hexie project did I make to share with you today? I've tweaked my design so that all that hexie goodness can be made from 3 charm packs. There's also a handy pocket for you to tuck your reading glasses (which I don't need just yet, thank you ;o) or in the case of my son, it's a pocket for placing his MP3 when he's relaxing on his own pillow. It just so happens I stitched up another hexie project this summer. Click here to see more. 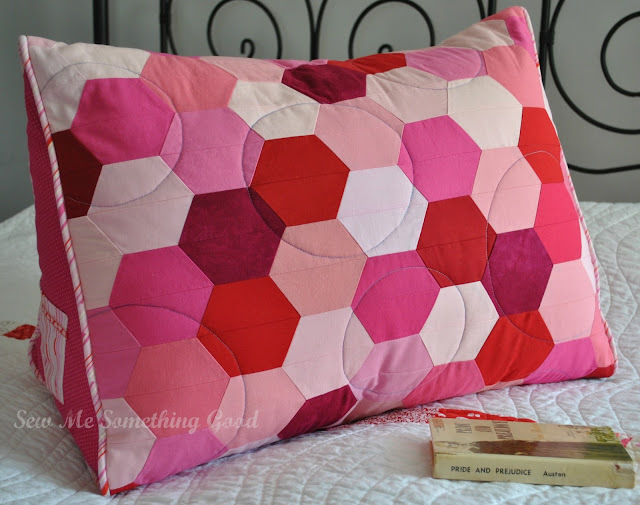 I love to read before going to sleep at night and this pillow allows me to do so in comfort! Wouldn't you like one for your bed? You're in luck! My PDF pattern is now available on Craftsy! 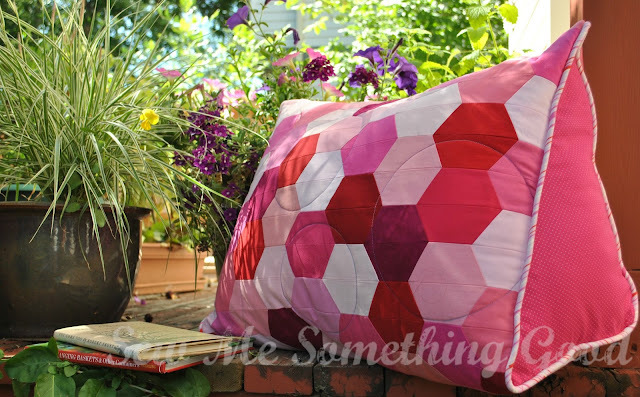 Are you ready to fall in love with hexies? Let's go hopping!!! 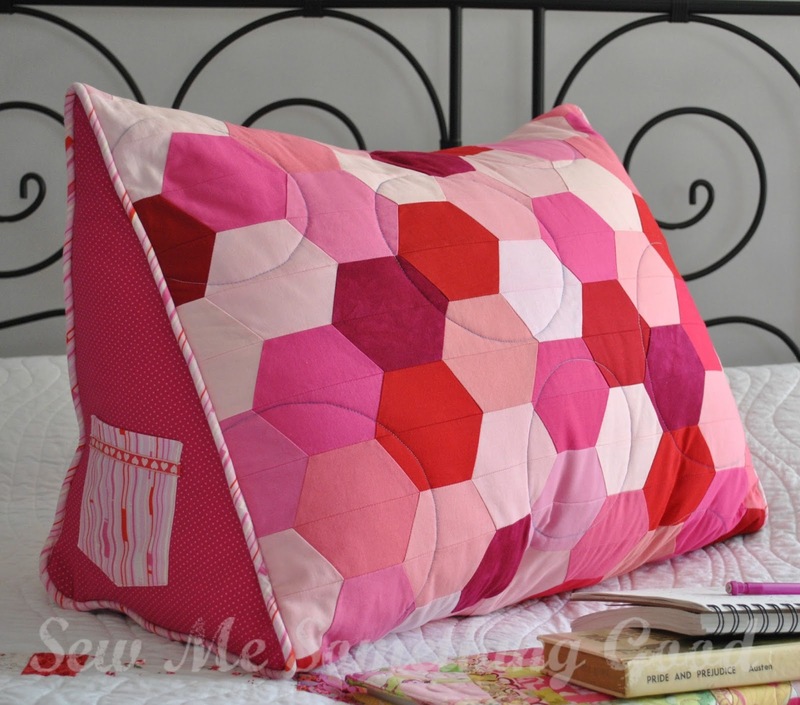 Studio Spotlight series on Ellison Lane Quilts. Did you go on the virtual tours, too? 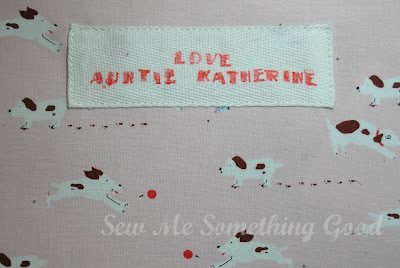 I loved seeing where others create and find lots of inspiration and a sense of sisterhood knowing that I'm not alone in my love of sewing (and fabric ;o). 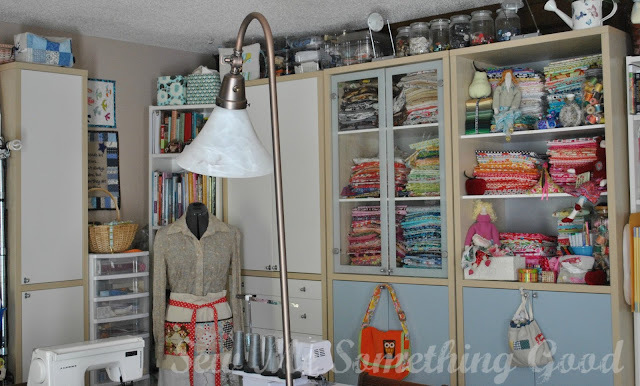 This week, Jennifer is hosting a link-up for sharing where we create and I decided to add my own sewing space to the list. 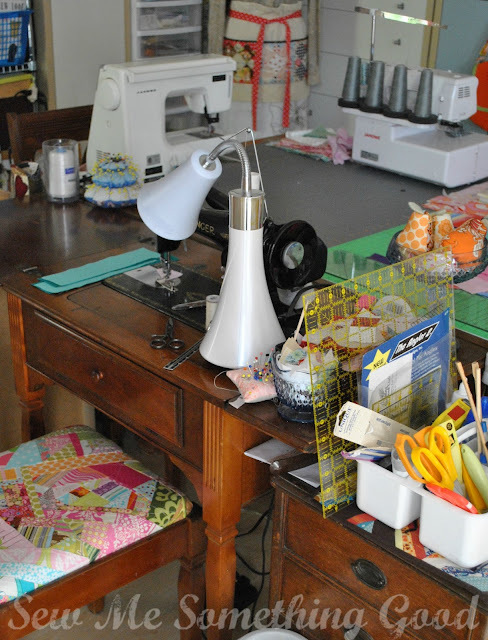 Welcome to where I sew! I feel very fortunate to have a room dedicated to my creative pursuits. For most of our married life, I've made do with shared space (meaning I used the dining room table and stored fabric etc. in closets throughout the house) but the floor plan of the house we're currently renting had an open family room (adjacent to the kitchen) which my husband declared I should use for my sewing room. 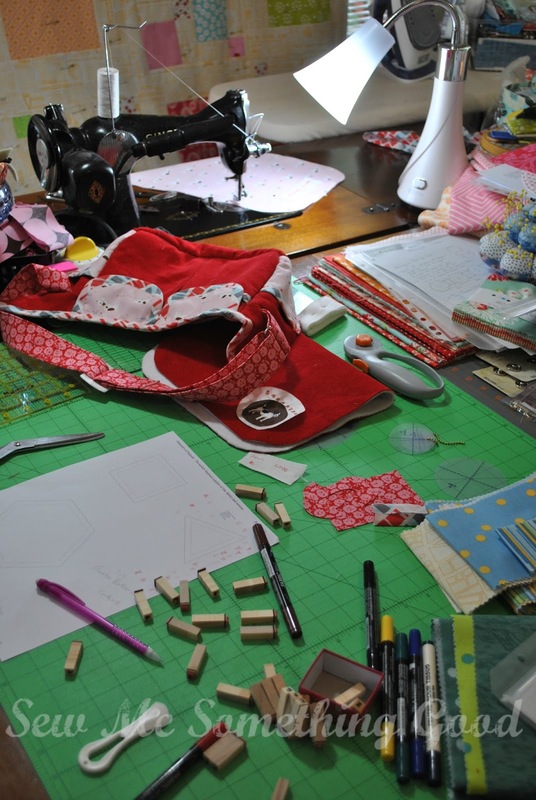 I'm still using our vintage dining room table for my cutting and sewing - but now I can leave everything set up and ready for me without needing to clear it for our meals. Lots of storage containers in use in my space. Some were bought specifically, while the clear plastic bins are recycled salad green containers. These work beautifully - allowing me to easier see what they contain while at the same time keeping the contents dust and wrinkle free. Starting out, I had my fabrics in Rubbermaid tubs stacked along the walls in this room... but in the past 3 years I've sought out various shelving systems made by IKEA (purchased in the second hand market, so other than the wire shelving units, you won't find these for sale at IKEA as they are older designs - the Magiker line). I absolutely LOVE what I've been able to put together for keeping me organized. 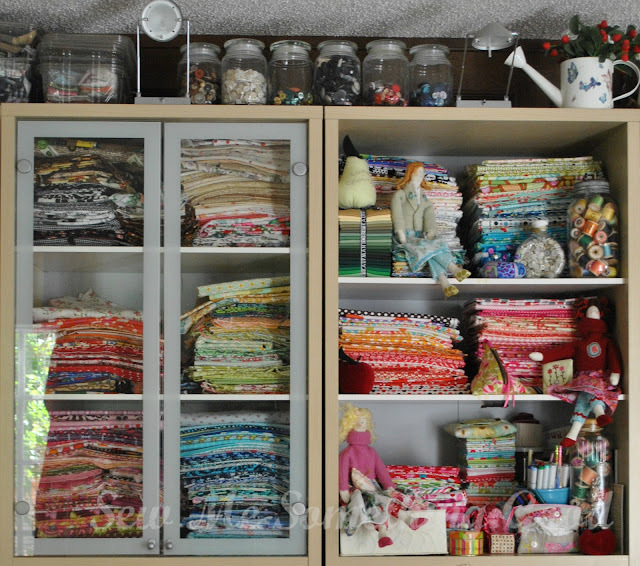 Since I not only enjoy quilt making, I have stashes of other fabrics hidden behind these doors. 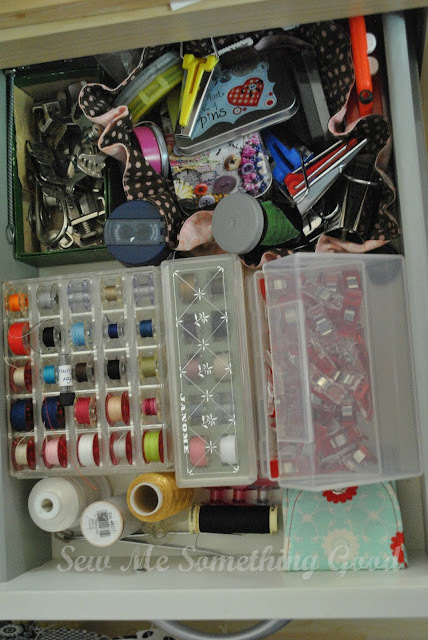 Everything located where I can find it to make my sewing more enjoyable. I've got tons of vertical storage with these cabinets! I love being able to view my quilting cottons while I'm sitting at my machine. 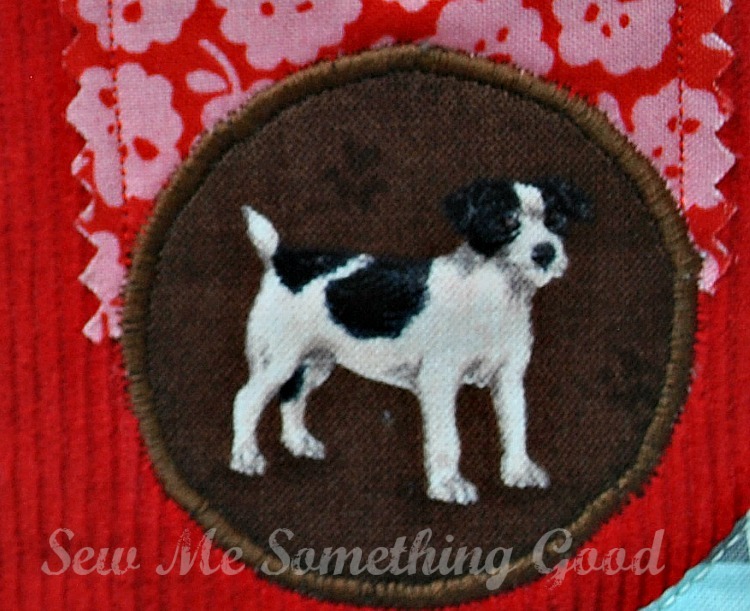 I find I sew more when I can see what I have. The cabinet on the left has shelves and drawers, which I find really practical. 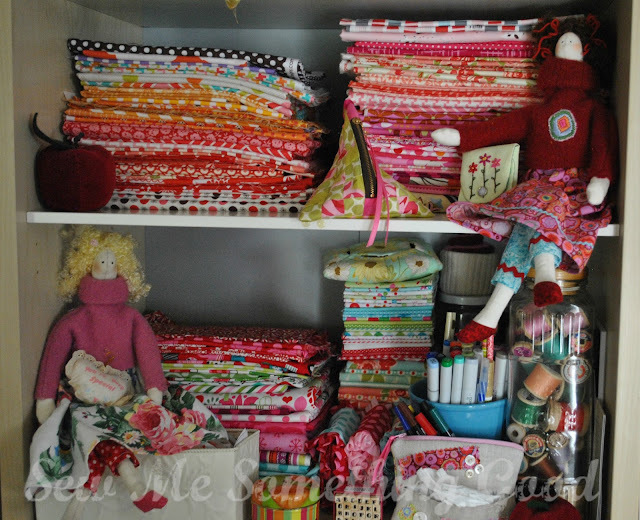 I have quilt backing and vintage sheets stored on the deep shelves and in the drawers I have scrap storage organized in bins by colour. Fabrics are grouped by colour, with prewashed fabrics in the cabinet with glass doors and those not prewashed in the shelves that are open. On the top on these units, I have my stash of buttons in jars that once held candles. Again organized by colour to make searching for the perfect button that much easier. Tucked in with the fabrics on these shelves you can see some of my favourite sewing projects and vintage spools of thread. This corner of the room is home to my sewing/quilting/crochet/knitting/crafting books on the top shelves and my quilt batting and polyfil on the lower shelves. 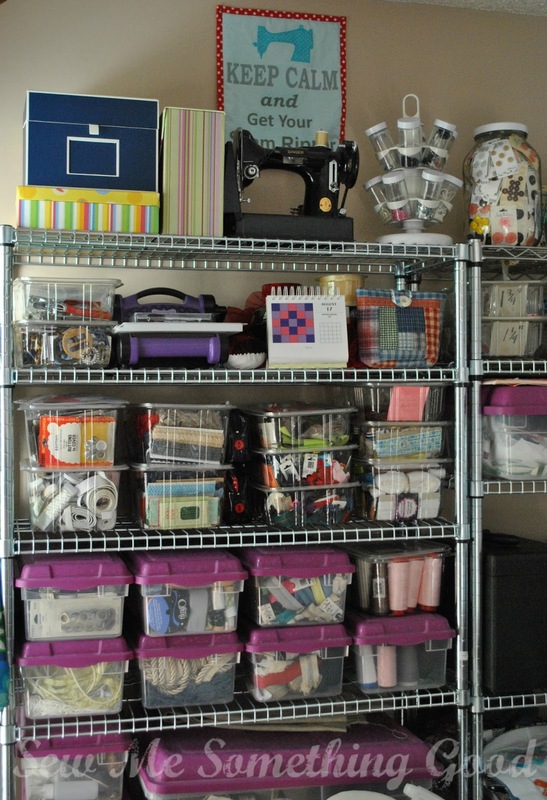 The rolling plastic shelving unit keeps sewing machine manuals, thread, knitting needles, crochet hooks and basting notions nearby and easier to find. It's like a sewing shop! 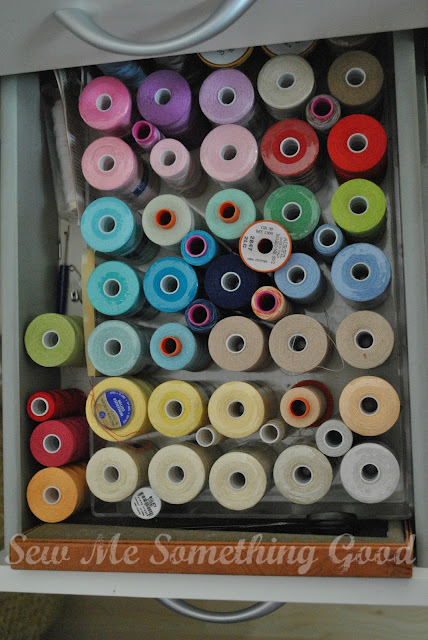 Elastic, zippers, buckles, snaps, ric-rac, serger cones and fancy trim - each in their own containers. Much of this accumulation is from countless thrift shop forays and means I have all I need to sew just about anything. Two stacked wire shelving units keep my notions (shown in above photo), within easy reach, while two other stacked shelving units (not shown) corral such things as fabric strips (each size in a separate container) and also hold some patterns and vintage sewing machines. Next we come to one of my favourite finds for keeping me organized. 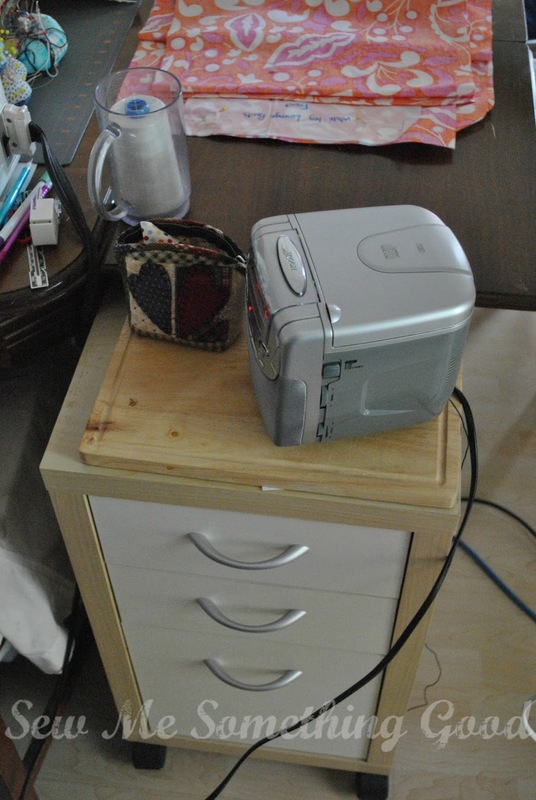 This three drawer rolling unit sits to the right of my domestic Janome and will roll under the table extension of my vintage Singer - leaving me extra room if needed - and holds my sewing essentials. The top drawer is for my bobbins - pink bobbins hold quilting wt. thread and clear bobbins hold all-purpose thread. Sewing machine feet for my Singer are here along with other nifty tools like those for bias binding and Wonder clips... not to mention pins, needles and some specialty threads. The second drawer is filled with quilting thread. Although I would love to display these beautiful colours, they are kept safe in a drawer, protected from damage from the sun and from dust. Two vintage beauties - the cabinet that is home to my beloved Singer and the small sewing cabinet that belonged to my cherished great-grandmother. This is where I love to be! I use my vintage machine predominately for piecing, although I've found I like sewing other things with her as well, and there is my two Janome machines - one for sewing everything from clothes to all my quilting and my serger/coverstitch machine for garment making. 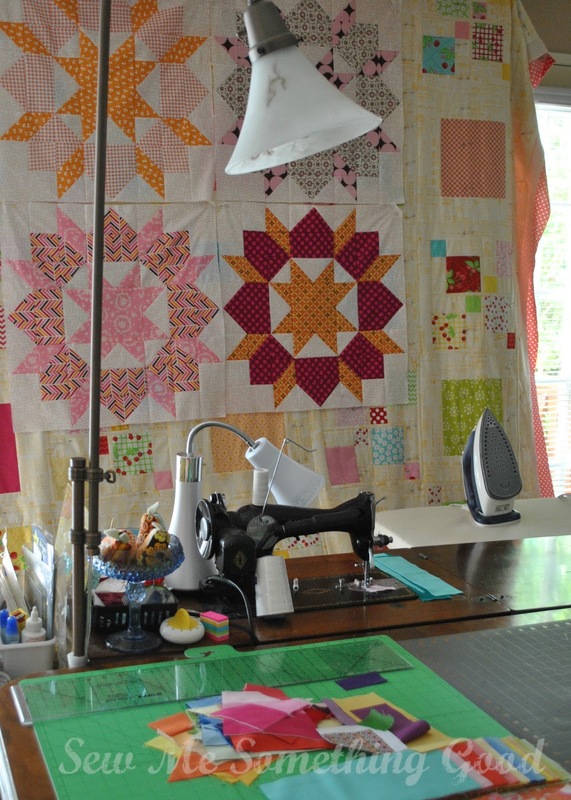 When I need to quilt, I remove the serger from the table and set my Janome up in its place so I have the whole table to support the quilt I'm working on. 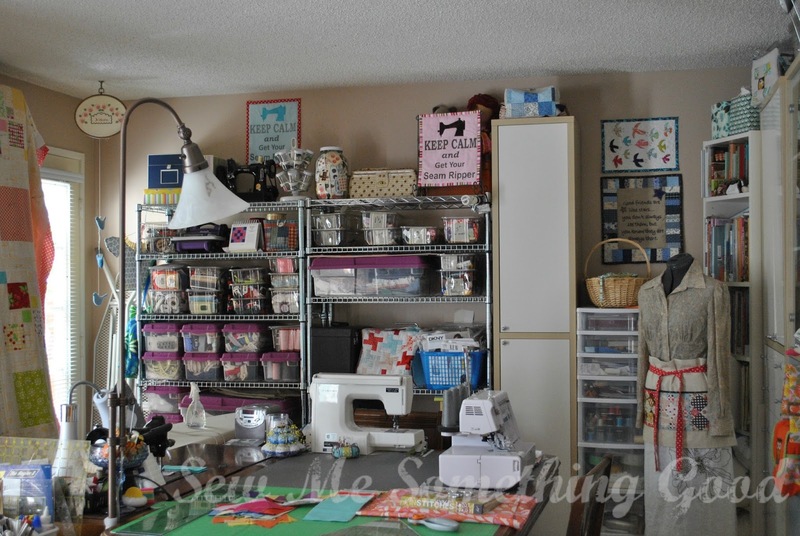 My cutting, sewing and pressing stations are all close to one another and I even have a wonderful design wall (which covers up the ugly brick fireplace we never use) situated between a window and a door on the third wall of my sewing room. My family loves seeing the never ending parade of "fabric art" on the design wall - it's the first thing they will see on their way into the kitchen and usually elicits a comment or two about what I'm working on. Every single day, I feel so grateful to have this space to call my own. A place that brings me so much creative joy and fulfillment. Thanks for letting me share it with you! 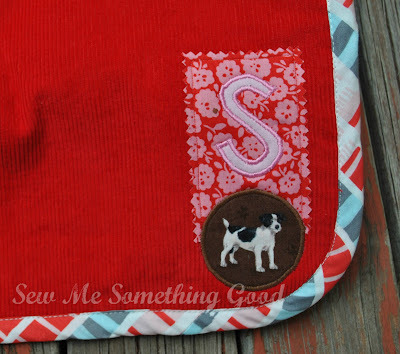 Oliver + S Little Things to Sew: 20 Classic Accessories and Toys for Children by Liesl Gibson. My first version is shown here and the second version is here. 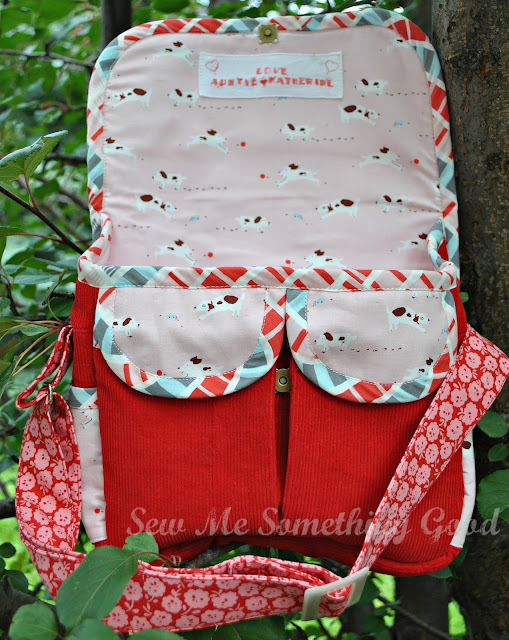 For both of these bags I featured owls, but with my latest bag being a gift for a "puppy crazy" niece, I came up with something special. with another wee pup on the back of the bag. to find cute puppies everywhere! 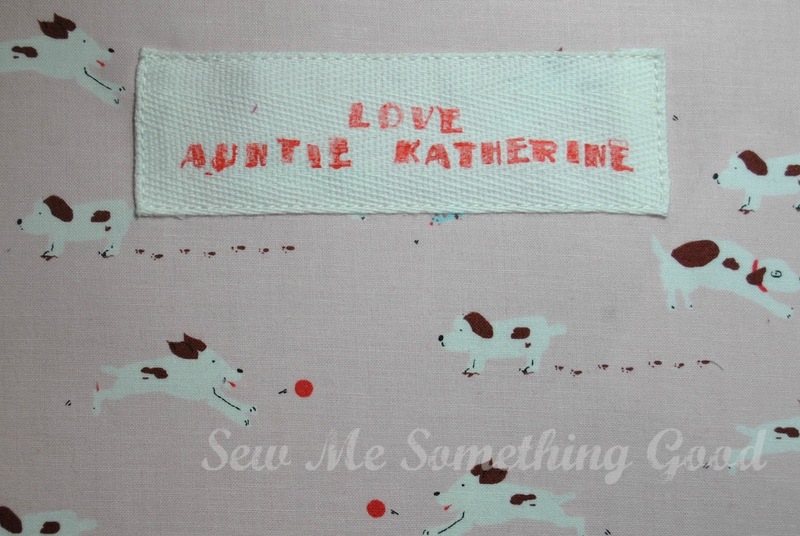 A peek at the stamps and fabric pens I used to stamp onto twill tape to make my custom label. 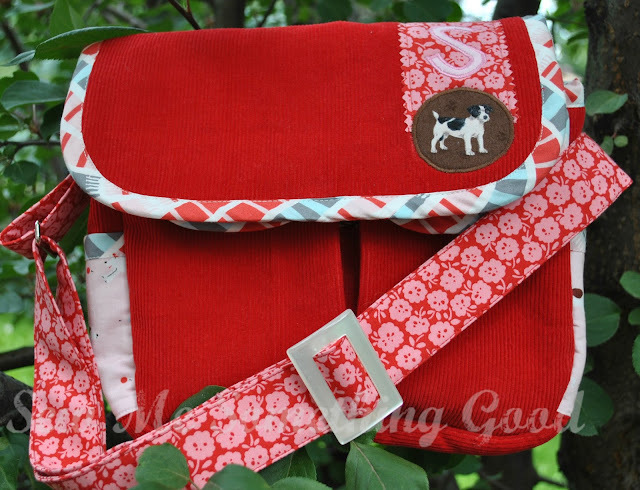 This is the third time I've paired corduroy with quilting cottons to make this bag and I love the results. 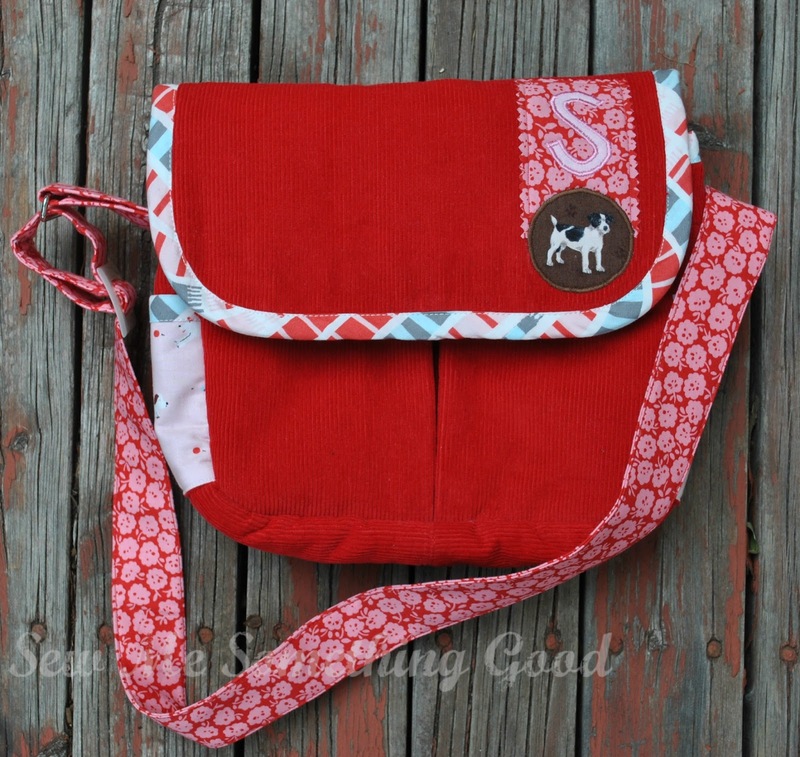 Other than adding the inset pocket on the back of the bag, I followed the pattern. Ahem, although there was my "brilliant" (choke, snort) idea to add fusible fleece to the bag. It is not something I will repeat - good thing my trusty old Singer doesn't balk at lots of layers. Even though the fusible fleece gave lovely shaping to the finished bag, it also made the bag sides resist the draping of the flap over the front (which is why you can see the pockets when the bag is closed ... leading to me adding a magnetic clasp). If I was to even consider fusible fleece the next time I use this pattern, I would extend the length of the flap to avoid this problem. Love that vintage strap slider from my stash! Summer has a rhythm all its own, doesn't it? 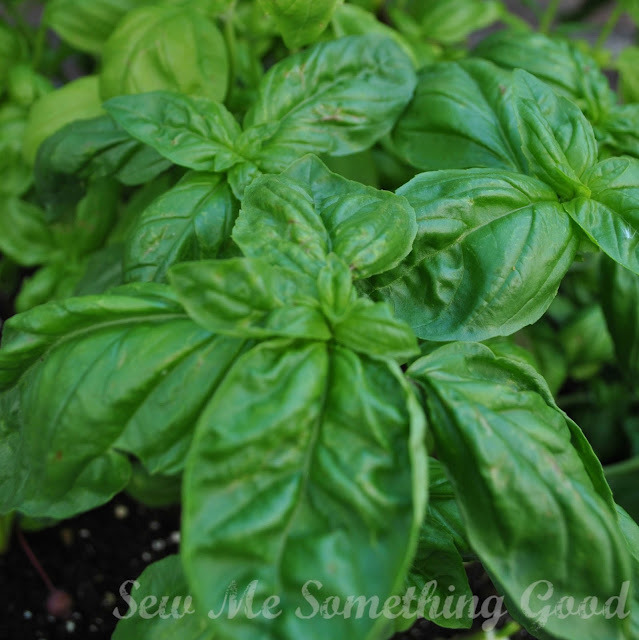 and the basil has been seasoning many fresh summer dishes. Summer is the season for fresh eating! 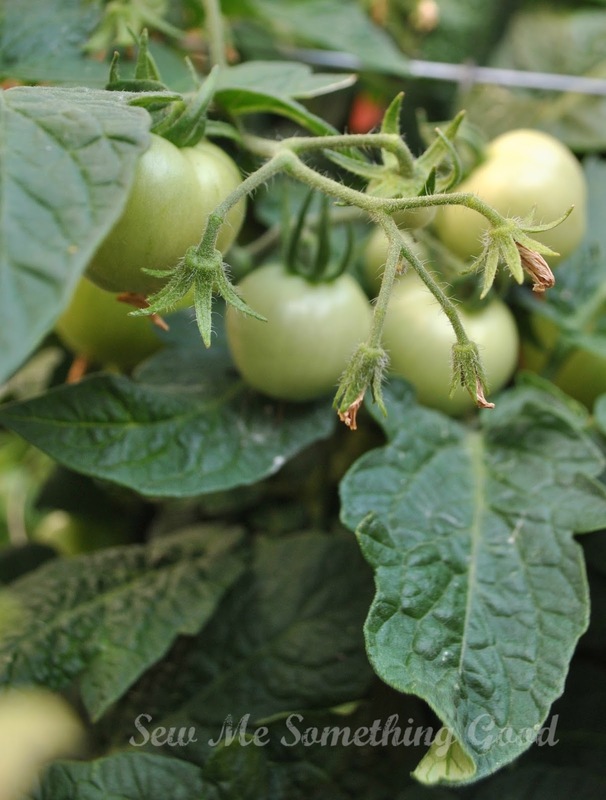 The local farmer's markets are in full swing, which means I've been making my canning plans for the season and placing my orders for produce. Hard to believe all those jars I filled last summer are almost all empty again! Where does the time go? 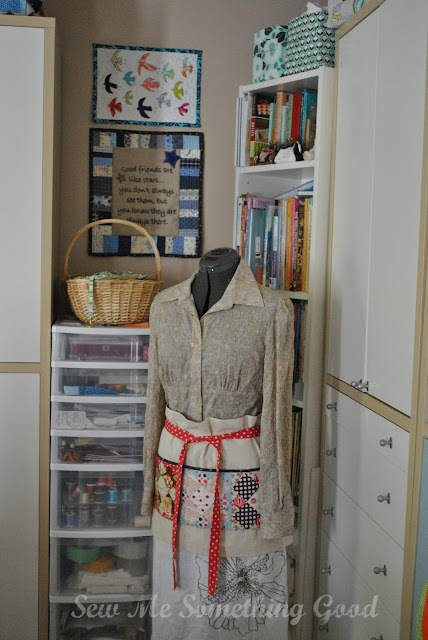 ;o) Along with seasonal activities, I've also been very busy in my sewing room. 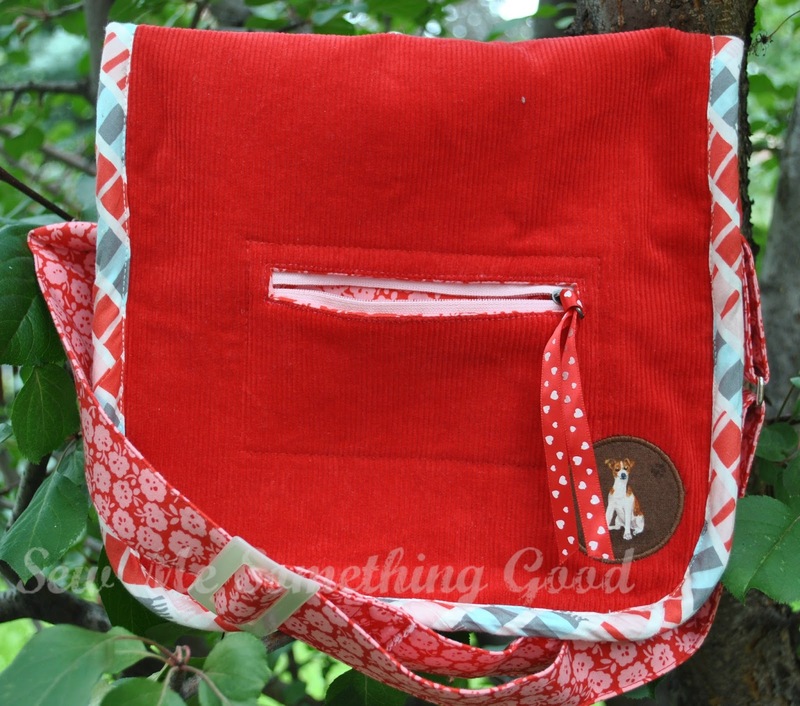 A little glimpse of a new design I've come up with and can hardly wait to share. Is summer just as busy for you? I can hardly believe we're into August already and that my 23rd wedding anniversary was on Monday. Crazy! Whether your summer is busy, busy or filled with some R&R... I hope you're enjoying this gorgeous season!